Idra Novey is a poet, translator, and newly-minted fiction writer. Ms. Novey was a Writer in Residence here at The Betsy Writer’s Room back in May, 2015. 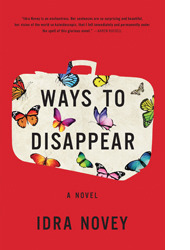 The Jewish Book Council recently interviewed Ms. Novey on her first novel, Ways to Disappear. Ms. Novey spoke about her novel during her stay with us. It addresses the power and powerlessness of parents, children, writers, and their translators, brought to light when an internationally acclaimed Jewish Brazilian writer vanishes into the branches of an almond tree. You can read the interview, conducted by Michelle Zaurov for Jewish Book Council, HERE. To learn more about The Betsy Writer’s Room Breakfast Arts Salon Series, visit thebetsyhotel.com/culture.